I have finally gotten around to posting this weeks "Card of the Week," and, as you can see, it features a dangerous looking Mike Piazza. 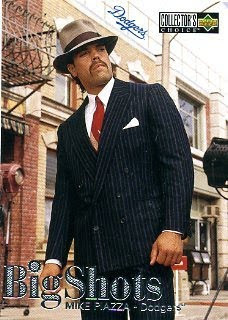 This is his 1997 Upper Deck Collectors Choice card and he is doing his best Al Capone impression. Late last night I was about to complete this post featuring another card, but stopped short when I saw this card at the Trader Crack's Card blog. It easily eclipses my previous choice and I had to award it this week's winner- with apologies to Trader Crack's. This card came out when I was absent from the hobby. So, this is the first time I have ever laid eyes on it. In fact, there is about a 5 to 10 year period where Baseball cards were the farthest thing from my mind. BTW, I still wish we never traded the guy. He was my favorite Dodger at the time.